From the city, it's 18km to get to Iwahig River. We took a van and we were quick to get there. The road was kinda scary as this is more on the country side where there are very few houses and lots of trees on the sides of a very dark road (they have no lights on the road) We went with 3 other groups so we were all busy talking inside the van just to distract us from scaring each other about white ladies. Of course, the Iwahig Mangrove Eco-tourism & Wildlife Park has electricity and it even has wi-fi access. 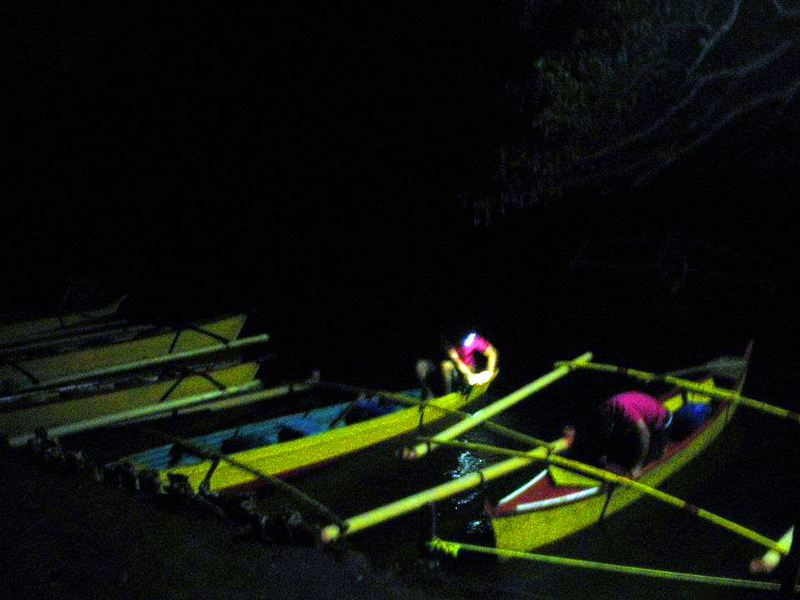 As soon as it gets dark, the tour starts along the river of Iwahig and their last batch would be around 2:00AM. 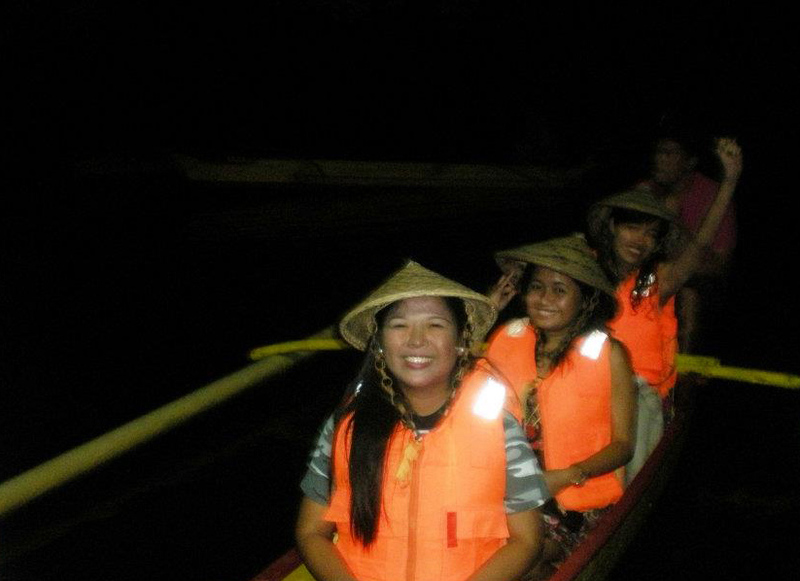 We were required to register and wear a life vest and a "salakot" (hat) A boat can accommodate 4 people (including the boatman/guide) as long as they are not all too heavy as this is a little boat. It's 600 pesos/boat. Camera flashes are strictly not allowed once the boat moves and leaves the dock. Our van driver shared his last words to us which was when we get to the middle part of the river . . . we should not panic. As soon as he said that, I panicked silently. It was pitch dark and we were in a tiny boat on a combination of a salt/fresh water . . . . Palawan is known for salt and fresh water crocodiles. Even if our van driver assured us that there aren't any crocs out there. Still, crocs are nocturnal and we couldn't see anything. I couldn't even see our boatman (i was in front and he was at the back) As he paddled the boat, he was telling us about the history, the wonders and jokes about Iwahig river, mangroves, fireflies and other species in that area. After his friendly reminders of what to do and not, he started his spiel and good thing he started with "there are no crocodiles here because the river is 30-40ft deep and crocs can't swim that good in deep waters" Then my heart beat started to slow down and went to it's normal pace. The river is surrounded by mangroves. I don't like them for the only reason that they are not pleasing to the eyes BUT appreciated them after our boatman, Atom shared the knowledge. My heart then changed to a faster beat once again but this time with excitement when I saw what it was like Christmas lights on trees. Left and right, there they were. It was just BEAUTIFUL. We attempted several times but failed to capture these enchanting visions with our cameras without flash. We finally decided that it was just best to enjoy the moment. The moon showed up & we could see it's reflection on the river. It was a romantic view . . . a perfect place for love proposals. We inhaled the fresh air . . . the freshest ever that I've experienced (good thing there weren't any firefly that I inhaled) The stretch of the river I think was around 4 - 5km but we only went to a kilometer and a half for reasons I cannot remember why (it might be from too much inhaling of fresh air he he) The ride is usually 30 - 45minutes (good thing we didn't have a Dragonboat team paddler) Zero mosquito bites as the river is super clean and the mangroves are very healthy. This activity just started 2008 with the discovery and assistance of ABS CBN Foundation Managing Director and an environment advocate Gina Lopez. Palawan is very rich with a healthy environment and this is one of the many things we should protect from the industrial world. A picture they say tells a thousand words but this I guess does not apply (aside from that we're not allowed to have camera flashes) I may have shared my wonderful experience here but just like my mission in having this blog (to share and encourage people to try, enjoy and live life), you have got to have this experience. It's worth more than a picture I assure you. Too dark to see him. I only saw our boatman, Atom after the ride. Pinay Travel Junkie - you said it!!! i'll be back on January next year to see it again. i want to go there and watch those fireflies. kasama ba yun sa package tour nyo? oh commute lng kyo jan? kelangan b mgpareserve jan like sa ppur? hi anne. your blogs are very helpful. thank you for sharing them with us. may i know what travel agency did you talk to in all these tours in Palawan? 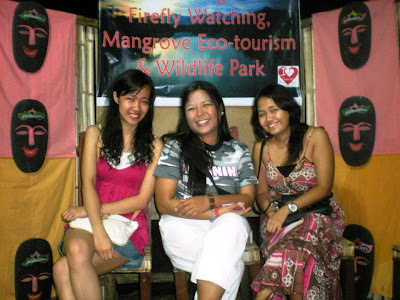 i am interested in trying honda bay tour, El Nido Island hopping tour and Firefly watching. hope you can answer me as soon as possible. thank you! GOD bless you!